Products: The Invisible Cleansing and Styling Powder. This dry shampoo style extender and volume in a pinch will rub out the oily effect on the roots. This sebum absorber is completely invisible due to its fine translucent powder with clay and extract of oat that leaves no trace. 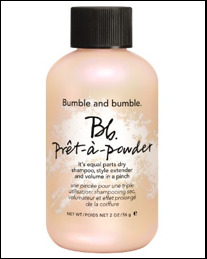 Bumble & Bumble has created a new formula for all hair types that missed a shampoo or need freshness. It creates instant volume and makes yesterday’s style ready to wear again. Collection Hair Tips: shake gently and massage your scalp (like you would a shampoo) to create instant lift and change your style freely. Be careful, for a natural effect use very little at the scalp and use your fingers to vigorously rub it in (especially for dark hair). For the modern woman who doesn’t have time to blow-dry every day and wish to give a fresher look to her style!